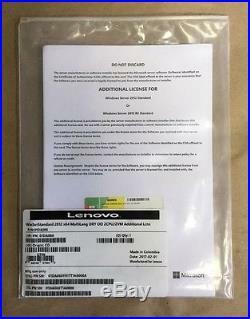 Lenovo Microsoft Windows Server 2012 Standard x64 2CPU / 2VM Additional License 01DA088. Or Microsoft Windows Server 2012 R2 Standard x64. Windows Server Standard 2012 R2 2CPU/2VM - Base License - OEM. Processor: 1.4 GHz 64-bit processor RAM: minimum 512 MB RAM Disk Space Required: minimum 32 GB Gigabit (10/100/1000baseT) Ethernet adapter DVD drive (if you intend to install the operating system from DVD media). Standard edition is ideal for those customers who want to have a physical or lightly virtualized environment. This edition enables you to run up to two virtual instances of Windows Server with each license and provides all the same features as Datacenter edition. The licensing for Standard edition will continue to be processor plus CAL, with each license covering up to two physical processors on a single server, just like Datacenter edition. The item "Lenovo MS Windows Server 2012 Standard x64 2CPU / 2VM Additional License 01DA088" is in sale since Tuesday, August 29, 2017. This item is in the category "Computers/Tablets & Networking\Software\Operating Systems". 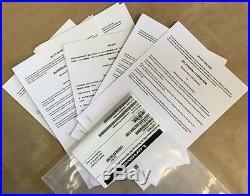 The seller is "gearbrokers" and is located in Kansas City, Missouri. This item can be shipped to United States, Canada, United Kingdom, Denmark, Romania, Slovakia, Bulgaria, Czech republic, Finland, Hungary, Latvia, Lithuania, Malta, Estonia, Australia, Greece, Portugal, Cyprus, Slovenia, Japan, China, Sweden, South Korea, Indonesia, Taiwan, South africa, Thailand, Belgium, France, Hong Kong, Ireland, Netherlands, Poland, Spain, Italy, Germany, Austria, Israel, Mexico, New Zealand, Philippines, Singapore, Switzerland, Norway, Saudi arabia, Ukraine, United arab emirates, Qatar, Kuwait, Bahrain, Croatia, Malaysia, Brazil, Chile, Colombia, Costa rica, Panama, Trinidad and tobago, Guatemala, Honduras, Jamaica.